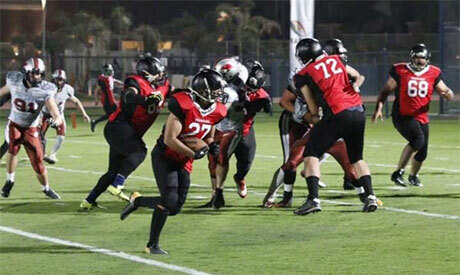 It seems the popularity of American football in Egypt is increasing rapidly, as evidenced by the interest a game generated between the Pharaohs of Egypt and the Falcons of the United Arab Emirates. Despite the match being held at the new district of New Giza and also just two hours ahead of Egypt’s Ahly match against Esperance of Tunisia in an African soccer cup final, there was a high spectator turn-out. And just as Egyptian fans were delighted with their team’s 30-6 victory, American fans who had come to watch one of their favourite sports also celebrated the team’s super win over the UAE. Head Coach of the Pharaohs Mohi Omar confirmed to Al-Ahram Weekly that “when we first started as clubs in 2011, there were rarely fans. Then as the years went by and people, especially university students, knew their universities had teams playing American football in Egypt, they started to come and watch, out of curiosity at the beginning. Then some wanted to join. The point is that it is not only the growing popularity of the sport but also in the number of players as well,” Omar said. Omar was player/coach for the Eagles team before deciding to focus on coaching, during which he led his team to more Egyptian Bowl Championships than any other team in the league. Now, as head coach and defensive coordinator of the Pharaohs, he has taken his new team to more glory with victory over the Falcons. For this game, Omar selected the most experienced player in the Egyptian American football league. The squad comprised players from five of the eight teams in the league: Eagles (14), Hell Hounds (11), Wolves (6), Bears (5) and Tigers (4). On the result, the Pharaohs’ head coach said the match was just a warm-up for both teams. “We were like testing each other because we have never played against each other. This was our first international friendly for the players and myself as a coach. It was sort of a guessing game,” Omar told the Weekly. Omar said the Pharaohs would soon be preparing for qualifications for the 2019 World Championships. “Hopefully, we can make it this time to the World Championships. In 2015, we lost our qualifier game against Morocco, the other country who plays the sport. But, it was different then; we were still beginners. Now, we are more experienced and confident and we will be training hard for the qualifications. The league season will start next February and run until May and that would be the best chance for us to get ready for our second official international match,” Omar added. Seifeddin Khaled was among the stars of the Pharaohs match against the Falcons, scoring six points. A member of the Eagles team in the league, Khaled did not forget to praise his teammate Omar Mansi who scored 12 points. He said he was glad Egypt had a chance to play an international game “even if it is a friendly. It was a great opportunity for us to play against a national team. With so many enthusiastic spectators around supporting us and cheering for every ball played, we played as if it was an official game,” Khaled told the Weekly. “This game showed us that we are in the spotlight and more popular. Back when we started in 2014, nobody knew anything about us except our families and friends. We started with only five men’s teams. Now we have reached eight men’s and eight women’s teams, which is really impressive and we hope it will increase. “What we really hope for is that famous sports club like Ahly, Zamalek, Gezira, Shooting and Heliopolis join our sport’s federation. That would really make a difference and will take the sport to another level in Egypt,” Khaled said.